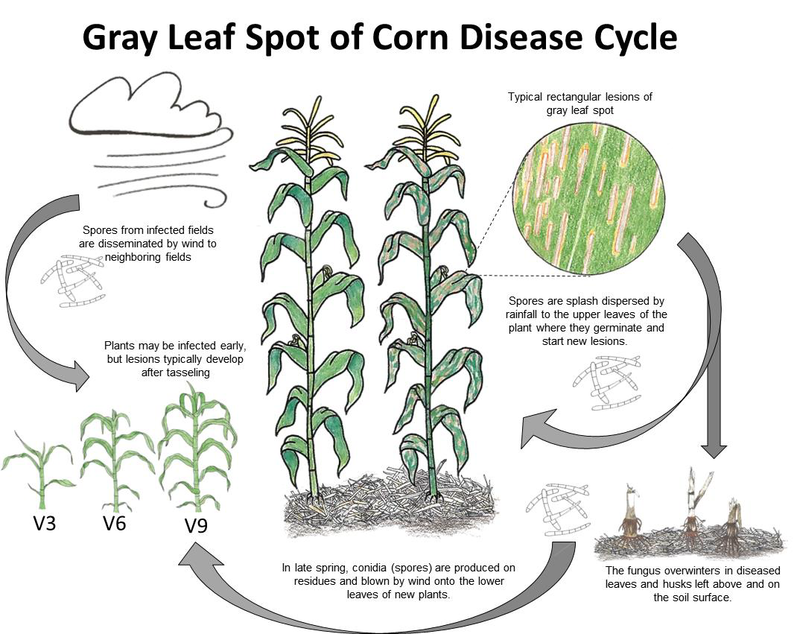 Gray leaf spot (GLS), caused by the fungus Cercospora zeae-maydis, has been one of the most prevalent foliar fungal diseases of corn in the state of Ohio ever since it was first reported in parts of Pickaway, Ross, Pike and Scioto counties in 1978. In the mid to latter years of the 1990s and early 2000s when highly susceptible hybrids were planted, conservation tillage practices become widespread, and fungicide options were limited, GLS consistently caused substantial yield losses, primarily in the more humid corn growing areas. Losses as high as 90-100% were reported. However, thanks in part to the widespread use of more resistant hybrids, GLS is currently less of a problem in Ohio and other Midwest states. In spite of its relatively high prevalence, it rarely reaches high levels of severity early enough to impact grain yield. In most cases, it remains restricted to the leaves below the ear. However, in some years GLS still causes losses in localized areas of the state when susceptible hybrids are planted into no-till fields and conditions are favorable for infection. Reports of high disease severity are more frequent from low areas and river bottoms fields where periods of leaf wetness and high relative humidity favor infect and disease development and spread. Under these conditions, yield losses ranging from 5 to 40 bushels/acre may occur. Reduction of the green leaf area, particularly during grain-fill, causes less sugars to be produced, which translates into lower grain yield. In addition, extreme damage to the leaves leads to premature plant death, lowering the value of the crop as silage and makes plants more prone to stalk rot and lodging. The early GLS lesions are yellow to tan in color and look very similar to those of other diseases, except that they often have a faint watery halo which can be seen when held up to the light (Fig. 1A). After about two weeks, lesions appear tan to brown in color and rectangular in shape, bordered by the veins of the leaf (Fig. 1B). Individual lesions may be 3 to 4 inches long and 1/16 to 1/8 inch wide, depending on the distance between veins. 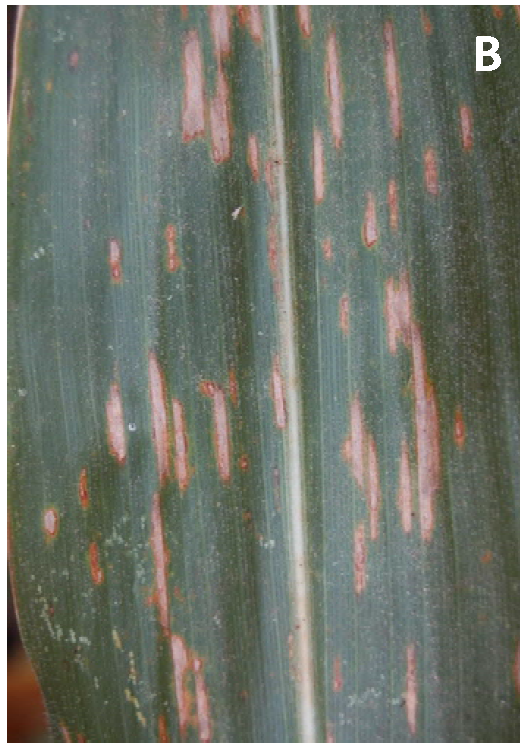 As the disease develops and lesions expand, huge areas of the leaf are damaged. The light brown color of the lesions is retained until environmental conditions are favorable for the production of conidia, at which time they take on a silvery-gray cast, hence the name of the disease. Hybrids vary in the coloration of lesions produced, with some having orange to yellow lesions. 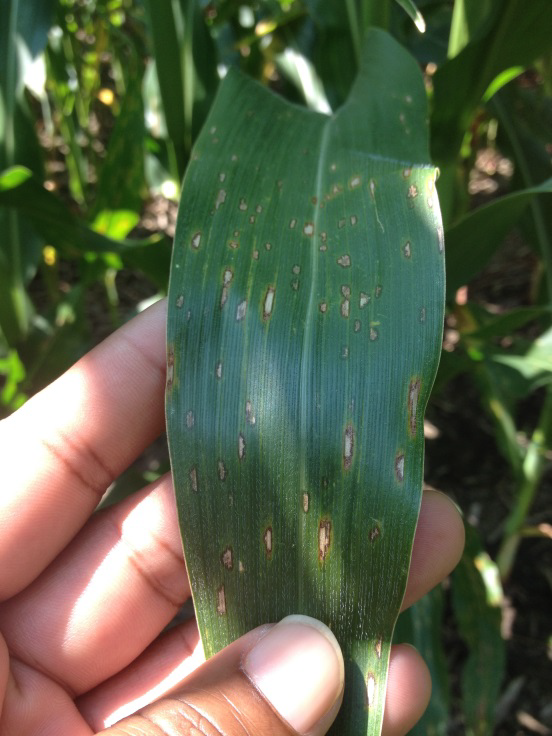 On some hybrids, lesions may develop on the leaf sheath and stalk. In addition, very high temperatures and dry conditions often restrict the expansion of lesions, causing them to appear as yellowish flecks without the typical well-defined borders. The fungus causing gray leaf spot overwinters in and on corn debris left above and on the soil surface. In late spring, in response to warm temperatures and high humidity, conidia (spores) are produced on residues. These are blown by wind onto the lower leaves of the present season's corn plants. Usually, the initial infections occur in mid-June to late June but the disease does not begin to spread rapidly until late July and August. The earlier the infection occurs, the more time there is for secondary spread and leaf damage, resulting in greater yield reduction. Fig. 1. Side-by-side close-up images of early irregularly-shaped (A) and typical rectangular (B) lesions of gray leaf spot. Note the well-defined margins of the lesions in B. Infection requires 11 to 13 hours of dew or foggy conditions and relative humidity in the canopy to be at or above 90% for an uninterrupted period of 12 to 13 hours. Under these conditions the fungus matures and produces conidia, which are blown to the upper leaves of the plant where they germinate and start new lesions. However, excessive amounts of free water on the leaves may lead to secondary conidiation, i.e. instead of germinating and penetrating the leaves, secondary spores are formed from the germ tubes. After infection, lesion expansion and sporulation depends on temperature, moisture, and the susceptibility of the hybrid. The largest lesions and the highest rates of lesion expansion occur at temperatures between 25 and 30°C (77 and 86°F). Once moisture is not limiting (relative humidity > 90%), maximum sporulation also occurs at temperatures between 25 and 30°C. River bottom and weedy fields planted late with a susceptible hybrid into corn stubble are at the greatest risk for gray leaf spot. Cool moist air flows into these fields causing condensation on the leaf surfaces and maintains high humidity longer in the canopy, favoring spore production and infection. In weedy fields the weeds help to hold humidity and prevent the drying of leaf surfaces by blocking air movement through the canopy. Hybrids with partial resistance to GLS are available. Ask your seed supplier for these hybrids. Crop rotation and clean plowing are effective at reducing in-field inoculum buildup. A two-year crop rotation away from corn is effective if reduced tillage must be maintained for conservation purposes or a one-year rotation with clean plowing is recommended in fields that have had a problem with the disease. Fungicides are available to manage gray leaf spot. These are recommended when susceptible hybrids are planted in fields with a history of gray leaf spot. It is important to apply fungicides early in the season before significant leaf damage occurs. Thus, fields should be scouted at the V-10 to V-14 growth stage. Check fungicide labels for appropriate timing of fungicide application. Applications made between tasseling (VT) and brown silk (R2) provides the bests results in terms of disease control and yield increase. Early applications (V4-V10) and less effective than VT-R2 application in terms of disease reduction and yield. Although some fungicides may lead to a yield response when GLS levels are low, the highest and most consistent yield responses occur when there is disease to control.